Water Level: Reservoir is 45% full. Piute Reservoir is at the north end of Circle Valley,	north of Circleville and south of Marysvale. It is a large, shallow impoundment of a low elevation valley. The reservoir shoreline is publicly/privately owned and administered by the BLM and the Piute Reservoir and Irrigation Company with unrestricted public access. 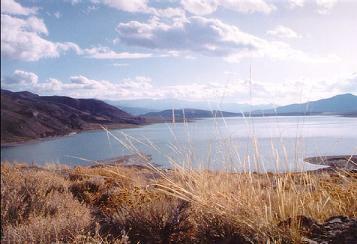 Piute Reservoir is directly accessible from Piute	Reservoir State Park located on US-89 between Marysvale and Junction. From year to year, the fishing cycle at Piute Reservoir can go up and down like a yo-yo. When the cycle is down, the fishing can be absolutely horrible to nonexistant, but when the cycle is up, the fishing is fantastic. On the average, the reservoir is almost completely drained one out of every six years. Trout fishing from boats is a good way to fish this large reservoir, but bait fishing from the bank is also popular. Road access is available along most of the west shoreline. Fly fishing, float tubing and ice fishing in the winter can also be productive. The ice fishing season is generally short, taking place mostly in December and January. The mornings are the best time to fish from a boat. Summer afternoon winds can make boating uncomfortable, or even dangerous. Mornings are often calm, with the wind not picking up until about 10 a.m. or 11 a.m. The wind often calms down again in the evening. Overall, mornings and evenings are the best times to fish. It can be a mistake to fight the wind all afternoon, when the fish bite is usually the slowest, and then be too tired to fish in the evening. You'll often catch more fish in the one-hour period before sunset than you'll catch all the rest of the day. A good plan is to get up early, fish during the calm morning period, take a rest during the afternoon when the wind blows, and then fish again late into the evening.